Original Art by Naj on show at the 2008 Rugby Exhibition. Below are mixed art exhibitions where Naj has shown works. 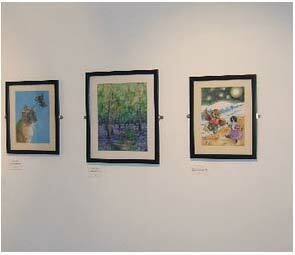 Up and coming exhibitions are also to be featured on this page, and will be highlighted, so do remember to check back! As the artist is based in Norfolk, UK, it is likely, although not exclusively so, that many future exhibitions may be in the Norfolk / east of England area.